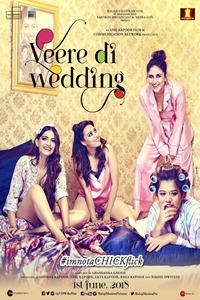 VEERE DI WEDDING is a high spirited and upbeat coming of age story revolving around the lives of four childhood friends Kalindi (Kareena Kapoor), Avni (Sonam kapoor), Meera (ShikhaTalsania) & Sakshi (Swara Bhaskar). Ten years later when these four best friends reunite, they don't realize how much life has changed from what they expected. The film is set against the backdrop of Delhi, where the girls are born and brought up, their trials and tribulations in modern day world, regarding family acceptance, marriage & societal perceptions.